Sport and Physical Education is at the heart of Falmouth School and Falmouth College. We strive to provide as many sporting opportunities to our students as possible and our new state of the art facilities will enhance our students experiences further. Please follow our facebook and twitter accounts for regular sporting updates and results from sporting events/fixtures and use this area of the website to find out about PE/Sport/Dance curriculum, useful Sport contact information, details about Primary Sport, outdoor education, fixtures and results and sports/dance trips. At Falmouth School we work hard to ensure students are praised and recognised for their sporting success. To ensure students are praised for their sporting achievements outside of school we need to hear from you. We have lots of exceptional sporting talent at Falmouth School. We work hard to ensure we recognise and celebrate sporting success at Falmouth School. 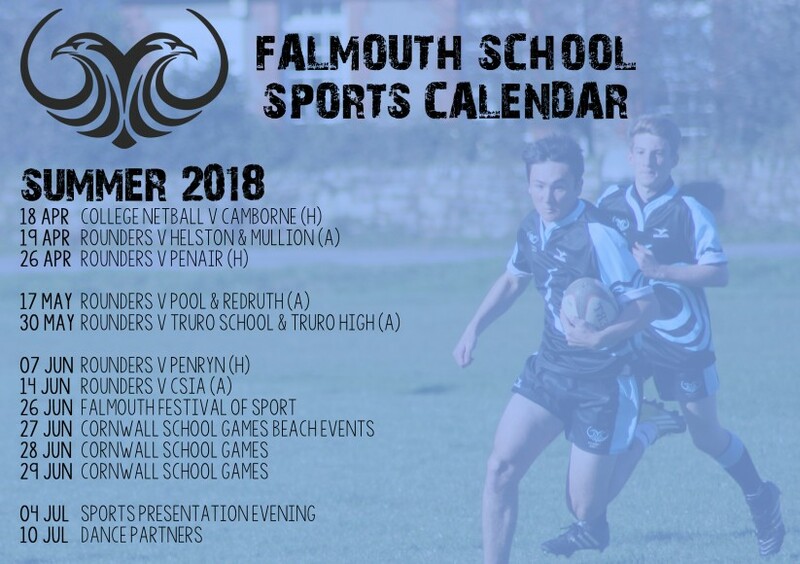 To ensure we know about all of your child’s sporting successes and achievements as the year goes on please email Mrs Benney directly cbenney@falmouthschool.net. Alternatively you could complete the form below and email it through to the same email address. This course is targeted towards young aspiring PE students who have a keen interest and passion for sport. Studying on this course involves a mixture of classroom theory and practical practice. Students wishing to study this course should be regularly taking part in school sport and extra-curricular activities across a range of sports which will give them appropriate knowledge and examples to apply in their written work and a strong practical ability to achieve well in the practical based assessments. Students will be assessed through coursework and practical assessment in three if the units and through an online exam for the final unit. In Year 9 students can opt to study a BTEC Level 2 in Performing Arts- Dance. Dance is a challenging but fun course for students who love practical tasks and team work. The course further develops ideas learnt in KS3; learning various dance styles and performing dances as a solo or group performer, choreographing dances based on a range of stimulus and developing practical dance technique. Students will learn about professional choreographers and companies and recreate their own versions of the pieces they study. Students will not only learn practical skills, but also how to analyse, evaluate and justify their decisions or performances. Students that have studied Dance at Falmouth School have successfully auditioned to study the subject at Edge Hill University, Roehampton University, Falmouth University and Bournemouth to name a few. All students at Falmouth School complete 100 minutes of Core PE per fortnight from year 7 right through to year 11. During these lessons students participate in a wide range of sporting activities and are assessed in the following areas; performance, fitness, healthy active lifestyles, tactics and strategies, ability to evaluate and improve performance, team work and leadership. Within Core PE lessons students are taught the importance of being active and teachers work hard to ensure PE lessons are fun and engaging for students to promote lifelong participation in sport outside of school. The extended certificate in Sport and Physical Activity is equivalent to 1 A-Level at the end of the two year course and gives students who are passionate about Sport the opportunity to study it alongside other A-Levels that may compliment it such as Science, Business, Psychology etc. In the first year students will study body systems and the effects of physical activity which will be assessed through an external exam, in addition to a practical unit on sports coaching and activity leadership which involves students being practically assessed internally. In the second year students will study sports organisation and development prior to sitting an exam, in addition to studying health and fitness testing for sport and the organisation of sport and physical activity which will all be internally assessed through the completion of coursework. The extended certificate in Sport and Physical activity leads into a wide range of sporting pathways in the sports industry including; sports science, sports organisation, sport coaching/teaching to name a few. Whether you plan to study at university, join the forces or gain employment, this course will effectively prepare you. The leadership aspect of the course and opportunities you will have to gain coaching experience. The extended diploma in Sport and Physical Activity is equivalent to 3 A-Levels and is a full time course that takes place over two years. In the first year of the course students will study the Cambridge Technical foundation diploma which is the equivalent of 1.5 A Levels. Units covered in year 1 include; body systems and the effects of physical activity, and sports organisation and development which will both be assessed through external exams, two practical units on sports coaching and activity leadership and practical sports skills which involves students being practically assessed internally, and coursework modules on the organisation of sporting events, sport and exercise psychology, physical activity for specific groups, nutrition and diet for sport and exercise and sports injuries and rehabilitation. The second year of the course will ensure students secure the full extended diploma. Units covered in the second year include three externally assessed units on working safely in sport, exercise, health and leisure, the business of sport and research methods in sports studies. Students also study four internally assessed coursework modules which include; performance analysis, improving fitness for sport and physical activity, health and fitness testing for sport and exercise and working in active leisure facilities. The extended diploma in Sport and Physical activity leads into a wide range of sporting pathways through employment or university courses including; sports science and analysis, health and fitness, physiotherapy, sports organisation and development, sports coaching and education. The leadership aspect of the course, along with additional qualifications you can gain including First Aid and the Higher Sports Leadership Award will ensure you stand out from the crowd and are highly employable. You will also have lots of opportunity to gain valuable experience coaching and officiating a range of sports across the two year programme to add to your CV. Dance is a thriving part of Falmouth School life and there are many avenues for students to participate in the subject. In KS3 students take part in Dance lessons through their study of PE; looking at Dance as part of cultural traditions from around the world and how it is used in the media today. Students can attend Dance club, Cheerleading, professional workshops and trips to see various professional productions. Falmouth School came second and forth in the Dance competition at the Cornwall School Games 2017, and there are performance opportunities as part of our annual whole school musical and 'Dance Partners' showcase event. In Year 9 students can opt to study a BTEC Level 2 Tech Award in Performing Arts- Dance. Dance is a challenging but fun course for students who love practical tasks and team work. The course further develops ideas learnt in KS3; learning various dance styles such as Contemporary, Bollywood, Jazz and African techniques, performing dances as a solo or group performer, choreographing dances based on a range of stimulus and developing practical dance technique. Students will learn about professional choreographers and companies and recreate their own versions of the pieces they study. Students will not only learn practical skills such as confidence, leadership and teamwork, but also how to analyse, evaluate and justify their decisions and performances. Students at Falmouth College have performed Dance works at the Minack, Pinetum Gardens and have gained units in Community Dance and Choreography by either leading clubs for younger students, or becoming part of the Production team for school performances. College students have lessons with lecturers from Falmouth University and are taught in their facilities on a weekly basis.